← What social media means to me? As I mentioned in a previous post, I’m a bit of a groupie for the tech marketing events so was eagerly looking forward to Social Media World Forum Europe which I attended yesterday. 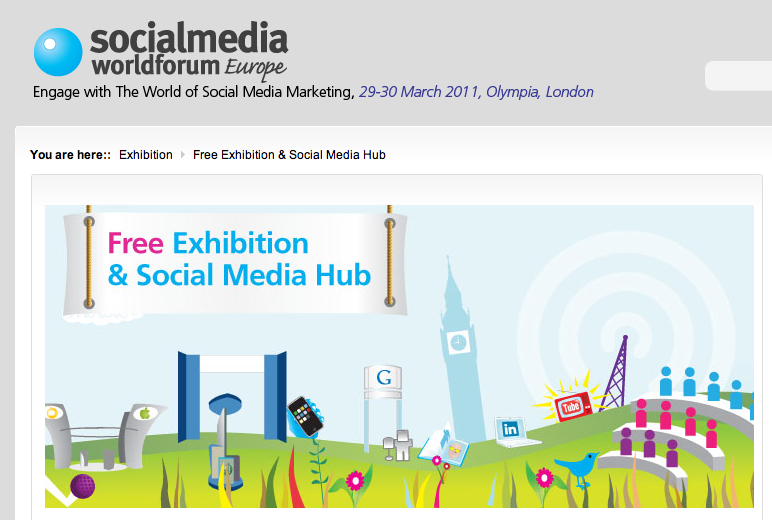 The conference was well promoted pre-event with a well stocked website, blog, Twitter account, and event hash tag #SMWF. In lieu of this, and because it was a self funded trip, I opted for the free entry to the exhibition and Social Media Hub. This, I assumed, would ensure a day of packed presentations and takeaway tips from interesting speakers getting to the heart of social media matters. I attended day two after falling to grasp from the website that b2b and sme featured on day one (doh!) With a paid stream (£395 for two days), it was to be expected that the calibre of the speakers and the brand case studies in the hub would not be as strong. That said, save a few insights (more later), the sessions comprising day two of the Social Media Hub were a let down for a number of reasons. I’ll come to in a moment. 1. SMWF used the right digital channels to promote the show and engage the audience attending and online. 2. The conference delivered big brand, keynote speakers for the paying delegates. 3. The floor design provided lots of space and opportunity for networking – the Networking Bar and Social Hub were well designed. 4. There were some great opportunities to face to face network with a number of Twitter contacts that I’ve now met! 1. I missed the Social Media Hub agenda before booking my day there. It was tucked away on the main program page – which non paying members wouldn’t click to. Had I known that the Social Media Hub had been focusing on b2b and sme on day one, that’s the day I would have attended. 2. Whilst in the main attractive and informal, I think the open aspect of the Social Hub, with its ‘drop in, drop out arrangement’ meant that the engagement of the audience at any one time was fairly low. The moderator had a tough job and in the end resorted to putting a microphone in people’s faces. 3. I echoed the same criticisms about overly promotional presentations at TFM&A in early March where exhibitors talked about their own products a little too much. That’s what exhibition stands, demo’s and sales people are for. When I attend a conference, I really want actionable, usable information I can take back and try in my business. 4. I sensed an audience in the hub that was aware of social media but practically naive when it comes to planning, selection of tools and execution. This was evidenced by a small show of hands to questions like who uses facebook, linkedin, twitter, quora, youtube (less hands with every social platform named). Despite this, the same social media cliches were trotted out. 5. A potentially fantastic session titled ‘social media planning’ degenerated into an issues/concerns people have about using Facebook, Twitter and YouTube. THESE ARE NOT THE ONLY SOCIAL MEDIA TOOLS THAT ARE AVAILABLE TO YOU! Surprisingly, the audience voted that of the three, YouTube posed the most challenges, not Facebook which is inherently personal and barred from a good number of businesses during the working day. Maybe, I missed the good b2b stuff on day one. If so, that’s my own fault. Or maybe its because I have a passion for supporting businesses that supply other businesses use the right tools, use them well and see some tangible results. Maybe its because I see mainstream nuts and bolts b2b (remove high tech, big brand and finance) shamefully missing from most conference programs. Or because I’ve been galvanised by recent talks that I’ve given to appreciative audiences. Which ever way I look it, there appear to be opportunities missed at Social Media World Forum. Which makes me feel relieved I didn’t cough up the £395 that others delegates did. Your view: Was SMWF value for money? So, before I publish my thoughts on some of the social media hub sessions (and there were some useful insights), a Linkedin Poll question. I’m interested in value for money. If you paid to attend out of your own pocket, was it money well spent? If your company paid, ask yourself , would you have paid to attend the conference if you had to? This entry was posted in Digital, Events, General, Social Media and tagged b2b social media, conference, marketing, marketing assassin, postaday, postaday2011, rene power, smwf, social media, social media marketing, Social Media World Forum, Wordpress postaday2011. Bookmark the permalink. I attended Day 1 (and paid). Sounds like the content in the paid stream was a lot better. I didn’t bother going to the free sessions as they’re always as you describe. Although a mixed bag, there were some good experiences shared and worthwhile paying for. I don’t go to many events, but this was the first that wasn’t Social Media 101. So full marks there. * On which note, I’m also not a big fan of events that rattle around in the event space chosen. I doubt Olympia 2 was the only venue available, so I’m guessing they thought it was going to be a lot bigger than it was. Which is interesting. Thanks John. Feedback so far seems to suggest that the paid stream was significantly better and did (broadly) offer value. I think there is a challenge for organisers when they have free and paid elements, especially with a £395 uplift. The experience of the free bit, in my view could have been better to ensure guys like me upgrade next time around. Sounds like I probably should. Plus I suppose there is the opportunity to network other more serious players and speakers? Actually, as the event was (relatively) small it was a perfect opportunity to network. Most speakers seemed to hang around – so you could get loads of benefit there for free.